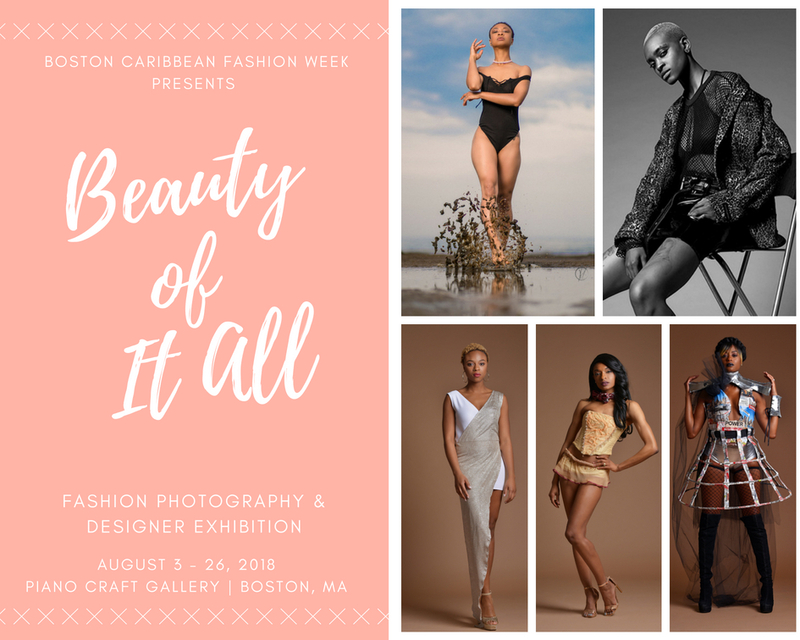 Boston Caribbean Fashion Week, a weeklong festival of diverse fashion events, celebrates its fifth anniversary this year with the theme, Beauty of It All, from August 8th through 12th. BCFW’s focus is about Beauty, Culture, Fashion and Style, and will center on the beauty industry along with celebrating past participants. The highlight of fashion week is their fashion show day, Aug. 11 at The Underground at Ink Block. This is a free event for the public with a VIP experience available for purchase for $60. VIP attendees participate in a rum bar sampling, have guaranteed fashion show seating, chair massages, and light bites and refreshments. The featured designers for the show are Barbadian designer Yolanda Sealy of Dress with Confidence, Boston designer Sparklle Thames of Sparklle T., New York designer Ty Scott of Ty Scott Label, recent Lasell College graduate Nigerian American Damilola Gilbert of Dami V., and Dominican designer Nacinimod Deodee of The House of Nassat. The featured exhibitor is Audi of Norwell, showcasing 3 of Audi’s 2018 newest designs and latest in technology luxury vehicles. BCFW was founded and is produce by Althea Blackford of VStyle Productions. BCFW Opening Night Reception on Aug 8: Celebrate the fashion week and debuting the gallery exhibit in a Caribbean style at the Piano Craft Gallery from 6-9 pm. Tickets are $10. BCFW Caribbean Dance and Music Workshop presented by Racines Black Dance Festival on Aug. 9: Learn about Bomba, a traditional Puerto Rican Dance and music workshop/demonstration lead by Jorge Arce, Producer and Artist at Humano Multicultural Project at the Piano Craft Gallery from 6 - 9pm. Tickets are $10. 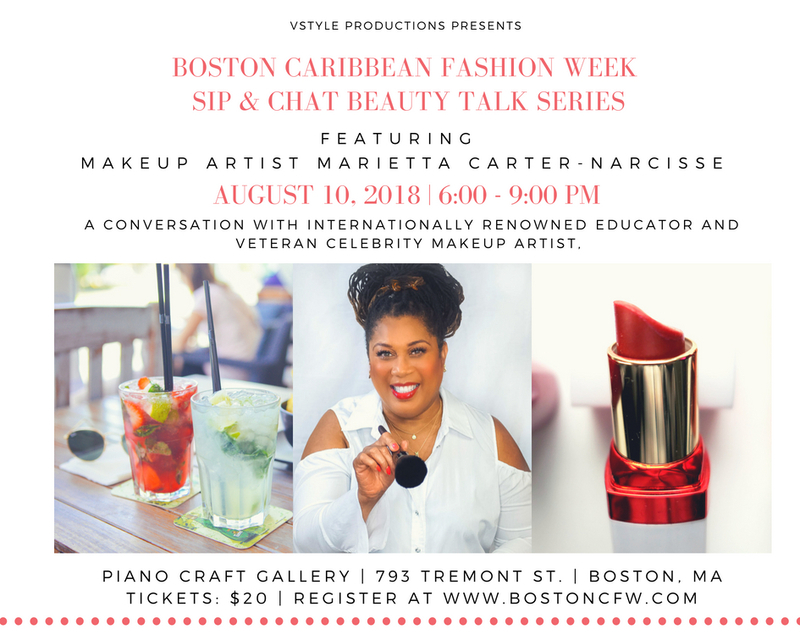 Barbadian Makeup Artist Marietta Carter-Narcisse, internationally renowned educator, and veteran Hollywood celebrity makeup artist speaks about her journey and experiences working in Hollywood. Event will be at the Piano Craft Gallery from 6-9pm. Tickets are $20. BCFW Fashion Show at The Underground at Ink Block on Aug. 11 from 2 – 7pm at 90 Traveler St., in Boston. Rain date is August 12 from 2-7 pm. BCFW Designer Pop-Up Shop on Aug. 12: An opportunity for attendees to shop the runway from the presenting fashion show designers. This free event is at the Piano Craft Gallery from 1-4 pm. 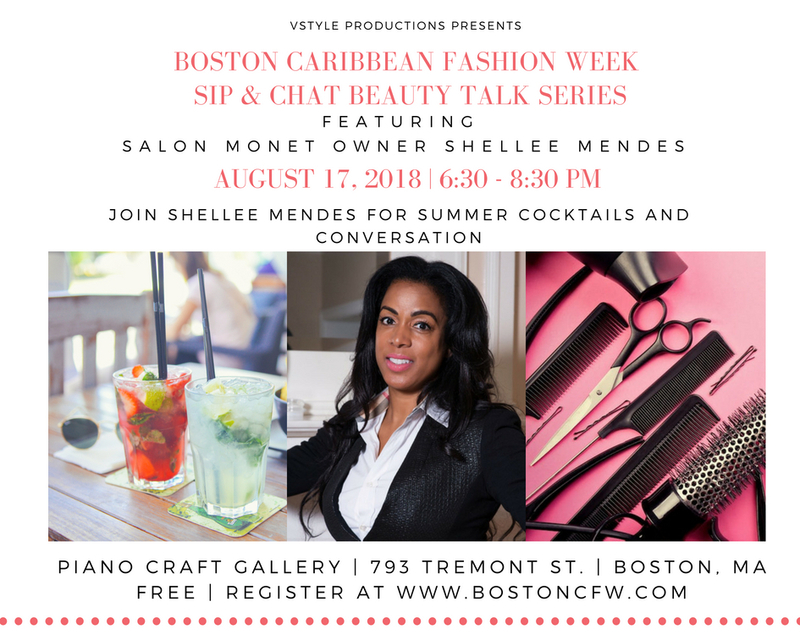 Join Shellee Mendes for Summer cocktails and conversation. 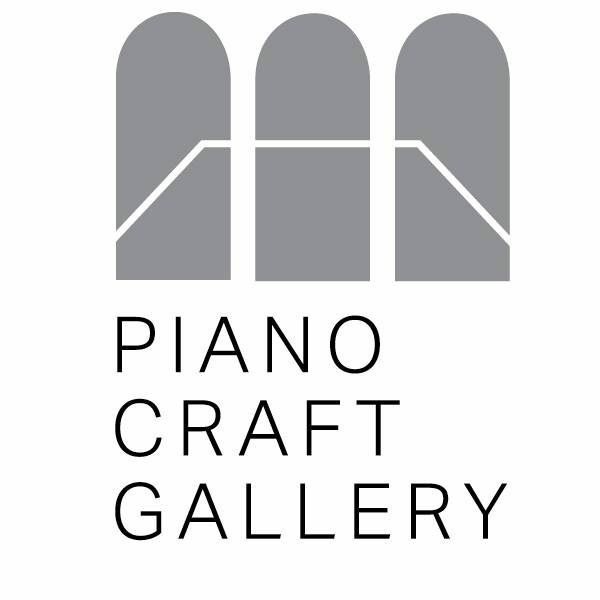 Event will be at the Piano Craft Gallery from 6:30-8:30pm. Event is free of charge!